Our range of alternative backpacks is sure to please any and every fashion fan. We’ve got rucksacks for those who love a splash of colour to the darkly gothic styles that you’ll want to include in your alternative apparel. Boasting a combination of both style and practicality, our collection of rucksacks are sure to keep even the fussiest bag lovers content. Our collection is full of bags of every shape and size. As well as your standard looking school rucksack, you can shop shoulder bags, messenger bags and you could even find yourself a handbag backpack. We cater backpacks for both fashion interests and practical use. No matter which backpack you opt for you’ll find that our range of bags promises both style and quality. Not only will your new alternative rucksack look fantastic when worn, but it will keep looking its best for a long time! Narrow your hunt for a brand new backpack by taking a closer look at some of our dedicated unique backpack sections. With so many styles available, you’re sure to find something you love. Colourful Backpacks – indulge in styles from all colours of the rainbow! Sequins and glitter are sure to add to any vibrant look, so make sure you’re ready to stand out from the rest. 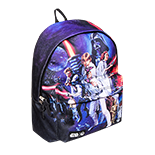 Cool Backpacks – designs from all your favourite pop culture tastes with unique 3D backpacks available. 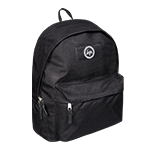 You can even shop official backpacks from your favourite rock and metal bands. 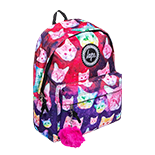 Cute Backpacks – if you love pastels, unicorns, kitty cats and pretty pinks then a cute rucksack is sure to complete any killer kawaii style. Fashion Backpacks – if you’re set on keeping it stylish and sophisticated, then a fashionable rucksack is sure to be more up your street. Make sure to browse our leather-look bags. Gothic Backpacks – dark styles oozing with gothic goodness, you’ll find plenty of rucksacks that will complete any alternative, occult or emo outfit. Skulls, spiders and coffins guaranteed! School Backpacks – mix practicality and awesome alternative style in your next backpack purchase. Perfect options for teenagers, kids and styles that adults could take to work. There is also a section dedicated entirely to cheap backpacks. Save a little more on your latest backpack purchase with discounted styles and clearance on certain brands. We are always looking to find you the best deal which is why we have plenty of sales and promotions when it comes to our range affordable backpacks. Stay tuned for special savings and offers on some of the most sought after backpack styles. When it comes to school backpacks, you can be sure that the styles can be wide and certainly varied. If you want a smarter option for your bag for school or your rucksack for work, then make sure to check out the options we have when it comes to plain backpacks. These smart and sophisticated options are perfect to match with a more formal outfit and won’t stand out if you have stricter uniform rules. If you’re on the hunt for school rucksacks with more vibrant and fun styles – then you’ve certainly come to the right place. There are plenty of funky backpacks in our range to enjoy. Express yourself with a colourful design or show your love for your favourite fandom or band with some official merchandise. 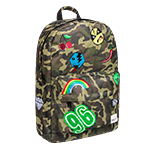 If you consider yourself a true rocker, then a punk backpack is sure to help to vamp up you alt look. Go ahead and explore our Official Band Merchandise section for a rocking range of rock band backpacks. We’re pleased to stock brands such as Rocksax and merch from the bands themselves which mean you can show your love for your favourite band wherever you go. Rock out with some of your favourite old school bands with your very own emo backpack. If its festival backpacks you’re after but you want something a little smaller for this year’s adventure then make sure to head to our dedicated festival bum bags section. We have plenty of exciting alternative backpack brands now featuring on our store. Step up your backpack style with popular brands such as Hype, Eastpak & Spiral. 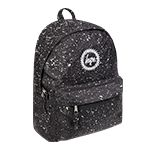 And the better news, UK customers can enjoy FREE delivery when purchasing any Hype backpack or Eastpak bag! There are plenty of bags with a unique pop culture style from all of your favourite video games, TV shows and movies. As well as these renowned brands, we are also pleased to stock our own range of fashion backpacks that stay true to our unique Blue Banana style! Amongst our expansive collection, you even find the popular style of faux leather backpacks that will be right at home in any alternative outfit. 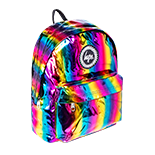 There are shiny sequin backpacks and even UV rucksacks included in our range. No matter if you’re searching for backpacks for women, men, teenagers or kids; Blue Banana will have something to cater to your needs. Each and every demographic will be able to find something that appeals to your needs. We’re sure that a backpack from Blue Banana will become an accessory you’ll want in every outfit. Both of our backpacks for adults and bags for children are popular picks in our store so pick up yours before they go! When looking for a brand new backpack, you’ll also want to know about the size of your new bag. A common consideration is the size of the bag as not everyone is able to take one of our mini backpacks to school. Many of our backpacks will fit an A4 folder or small laptop, which makes them super practical for both work and school. They’ll be room for all your books and belongings in your new bag, and there are always plenty of additional compartments and pouches ready for your gadgets and gizmos. We do pride ourselves on providing plenty of Goth backpack styles with skulls and spooky designs, but there are plenty of options available for those that love cute, kawaii and even vintage styles. Keep it varied, keep it cool and keep yourself looking good with an alternative backpack from Blue Banana.